The first thing you need to do is to decide with your fiancee what type of music you both would like to hear at the reception. Classical? Traditional? Modern? Sappy? 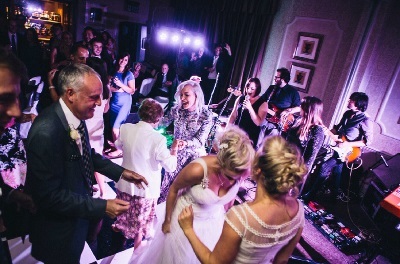 The choices are endless in the types of music that you can get for your wedding reception. But, knowing what you want, and what you don’t, will help you to narrow down the list of bands that you have to choose from. Ask around. Chances are that you have friends and family who will have used or know of a great wedding band. These recommendations are great because usually the person recommending them has heard them play and seen them perform, so you already know what you are getting. They can also tell you about the type of music that the band plays to help you know if they would be right for you or not. Ask some of the local wedding and bridal shops. Usually these stores know all about the wedding industry in your city or town, so they will also know the best wedding bands around and be able to recommend them based on the fact that other customers have used them or that they know them personally. When you get a few names of wedding bands in your area, call them all and ask to meet with them. When you do meet with them, ask to hear a sample of their music, either from a tape, video, CD, or live. Most bands will already have a sample tape for you to listen to because they want to show you what they can do for your wedding. If they are an experienced wedding band, you will know it right away. You can also ask them what types of music they normally play at weddings. If they have a long list, then this is a great band to go with. If they don’t have a normal playlist or they have never played a wedding reception before, then you might think about choosing another. If you are choosing a DJ, start by calling your local radio station that you listen to on a regular basis. Each radio station in your city will offer a DJ service that is not much more expensive than the DJ in the yellow pages. And, by calling the station that you listen to the most, you will already know what type of music they will be playing at your wedding reception. If you don’t care for the prices of the radio station’s DJ service, then you should start to call the DJ’s that are listed in your local yellow pages. These DJ’s are private companies and usually you can haggle with them a bit on the price and playlist as they aren’t corporate owned and have to keep customers happy to keep gigs. So, if you are on a tight wedding music budget, then this is the way to go. But, make sure that you ask for either references from other weddings that they have played or to hear a sample of their music that they normally play at weddings. Just do your research on each band or DJ and know what they play and do. This will help you more in the long run than how much the band or DJ charges to play for your reception. Knowing that the one you hire will do exactly what you want is priceless.